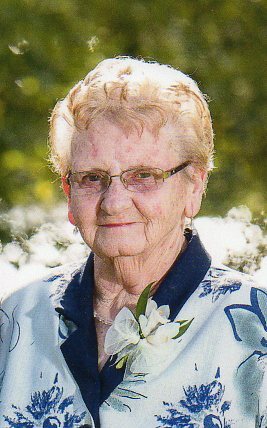 Passed away peacefully at the Welland General Hospital on July 5, 2018 at the age of 96, with her family at her side. She was predeceased by her beloved husband John (1995). Loving mother of Gloria (John) Zawaly. Cherished gramma of Janna Zawaly and Jeremy (Jenny) Zawaly. Adoring great gramma to Connor, Remy and Quinton Zawaly. Fondly remembered gramma #3 to Lyndsey Wintle and Jason Bank. Great gramma #3 to Lauren and Ben. Dear friend of Lexa and Terry Wintle. She was a very special aunt to Donna Mason and a special great aunt to Sue Mason. She was predeceased by 3 brothers and 3 sisters. Ruth worked at the Plymouth Cordage during the 2nd World War and then at Bright's Canning factory for over 20 yrs. She was very devoted to her family and her extended family. She enjoyed watching the Toronto Blue Jays and looking at the humming birds through her living room window. The family will receive relatives and friends at the WELLAND FUNERAL HOME 827 East Main St., Welland on Sunday, July 8th, 2018 from 2-5 p.m. Funeral service will be held at the funeral home on Monday, July 9th, 2018 at 10:30 a.m. Interment will take place later. In lieu of flowers, donations may be made to Niagara Children's Centre or a charity of your choice.